Sakitama Kofun Park (さきたま古墳公園) has comprising 9 burial mounds or Kofun located in Gyoda, Saitama. Kofun is the emperor's tumulus mostly built in 3rd to 7th century. From these tumuli have been excavated many important objects of historical and archaeological interest, including a sword which is classified as a National Treasure of Japan. This rare sword was found in the Inariyama Kofun. A pleasant path leads through the park ground where visitors may also enjoy relaxing on the spacious lawn or viewing the Iris and Lotus ponds. The exhibits of excavated artifacts at the museum provided excellent material for the study of the Tumulus Period (300 to 700 A.C.E.). At the reconstructed farmhouse the visitors will discover the style of life prevalent in the Saitama countryside until the 1950's. The name of Saitama is named after Sakitama. With a diameter of 105 meters, this is Japan's largest circular Kofun. The 19m high of the Kofun is the Kofun is the highest of all tumuli in Sakitama Ancient Burial Mounds. The volume of earth used at the Futagoyama Kofun. It is estimated that this particular Kofun was built around the first half of 6th century. This Kofun, which totals 120 meters in length, is surrounded by two rectangular moats. This is considered to be the earliest of a series of Kofun built in Sakitama, and is believed to have been created in the mid to late 5th century. The front portion of Kofun was lost in 1937, and reconstructed in 2004. This is a 90m head-rectangle-tail-circle Kofun with double moats. At the center and end of the tumulus is a "tsukuri-dashi" mound of earth. The stone chamber is built from stones from Chiba Prefecture. This Kofun is estimated to have been built in the latter half of the 6th century. No climbing this Kofun. 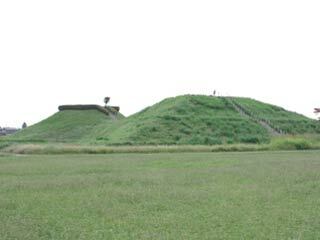 The burial mound is a138 meters head-rectangle-tail-circle Kofun with a 2 rectangular shaped moats around its perimeter. Futagoyama Kofun is the largest of all Kofun in Sakitama. This is estimated to have been created at the beginning of the 6th century. At present the inner moat contains water, however it is thought that at the time the burial mound was created the moat was dry. The total length of this Kofun is 53 meters and is the smallest of the keyhole shaped Kofun at Sakitama Kofun. It is surrounded by adouble recangular mote. Haniwa clay figures and images have been unearthed in this Kofun which is estimated to have been built in the first half of the 8th century. ...is a 73 meters head-rectagle-head-cricele Kofun with rectangular double moats. There is a "tsukuri-dashi" mound of earth, a kind of yard space at the middle where the rectangular and round sections join. Many haniwa artifacts such as clay figures and house shaped images have been unearthed in this Kofun which is estimated to have been built in the early to mid 6th century. ... is a 66.5m head-rectangle-tail-circle Kofun. ... is a 79m head-rectangle-tail-circle Kofun. ... is a 112m head-rectangle-tail-circle Kofun. ... is a circular Kofun. It is about 50m in diameter and 8.7m in height. It was built in first half of 7th century. Today it becomes shrine.